This luxurious, newly built holiday home is located on the Atlantic drive at Dundoan Lower, Downings, only one mile from the well known "Singing Pub" and two miles from Downings village. Superb white sandy beaches are just a few minutes walk from the property. You can enjoy golfing at Rossapenna Golf Links, an 18 hole course with its newly built golf pavillion and St Patricks Golf Links Carrigart. Other activites in the area include horse riding, water sports,deep sea angling,diving, walking,pitch and putt. The Magherabeg Leisure Centre is located in Downings and features a swimming pool, sauna, steam room, jacuzzi, and gym. A new spa is available in the Rosapenna Hotel. There are excellent pubs and restaurants in the area for music,dancing and dining out. The home consists of three bedrooms, the master bedroom is located downstairs and has a king size bed and en-suite bathroom with a walk in shower. Bedroom No. 2 is upstairs and has a double bed and walk in wardrobe and en-suite bathroom with sea views and walk in shower. Bedroom No.3 IS A LARGE ROOM with sea views and has 2 DOUBLE BEDS and en-suite bathroom with bath and overhead shower. Towels, bed linen,cot, high chair and stairgate are also provided. The fully fitted kitchen with Velstone worksurface is complete with fridge/freezer electric hob/oven,extractor fan microwave and dishwasher, There is good quality delph, cutlery, glasses and kitchen utensils provided for cookingand entertaining. A washer/dryer is located in the utility room. There is also a seperate toilet downstairs. The living area boasts a stone built open fire and breathtaking views of Mulroy bay, Fanad and Tra na Rossan, as does the dining area. A T.V and DVD/VCR player are also provided. There is a large Sunroom with comfortable seating and doors leading to patio and garden. Al Fresco dining may be enjoyed at the patio area which is fully equipped with a barbeque and patio furniture and sun loungers. The house has three bedrooms, Master bedroom with king size bed, en-suite with walkin shower. Bedroom No. 2 with double bed, walk in wardrobe, en-suite bathroom with walkin shower & sea views. Bedroom No.3 with sea views,2 DOUBLE BEDS, en-suite bathroom with bath & overhead shower. A seperate toilet downstairs. The fully fitted kitchen with Velstone worksurface, fridge/freezer, electric hob/oven,extractor fan, microwave & dishwasher, a washer/dryer in the utility room. Good quality delph, cutlery, glasses & kitchen utensils are provided for cooking. The living area has a stone built open fire,SatelliteT.V/ DVD/VCR player. A large Sunroom with comfortable seating & doors leading to patio & garden which is fully equipped with a barbeque, patio furniture & sun loungers. 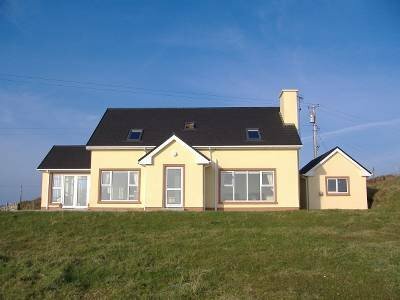 This room has wonderful views of Mulroy bay & Fanad & Tra na rossan beach.